Green Briar has been teaching jam-making for over 30 years in Sandwich, MA. If you visit Sandwich, there's a very good chance you'll find yourself in a jam. And a very tasty one at that. For more than thirty years, the folks at Green Briar Nature Center and Jam Kitchen have been teaching adults and children how to make jam. Name a fruit and they've probably made jam with it. There's blueberry pineapple, autumn pear and apple, lemon peach ginger and nectarine plum. According to Mary Beers, Green Briar's director of education, a favorite for attendees is anything made with cranberry and another fruit (like cranberry apricot) or strawberry (by itself or mixed with another fruit like orange). If you want to know what a pro likes, Beers's favorite is strawberry rhubarb. Although Mary doesn't teach the jam workshops now, of all the staff, she's taught jam making the longest. The Green Briar staff teaches jam making year-round. Classes are offered for both adults and families. If you are signing up for the family workshop, it is for one adult and one child working together and the child must be at least 6-years-old. "Family workshops offer opportunity for an adult and a child to have fun working together," Beer's said. 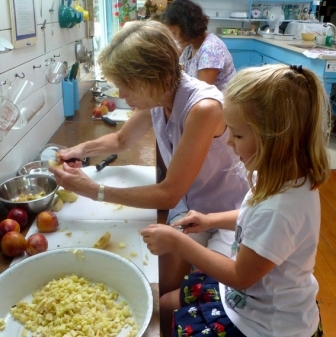 "It is amazing how children open up with Grandma as they both prep their fruit." Parents with more than one child find the workshops to be the ideal opportunity for special one-on-one time. Adults love the workshops too. Many people sign up for subsequent workshops once they've caught the jam-making bug. Socializing is as an important part of the workshop as the final product. Some ladies attendee about fourteen workshops a year! The best part of attending a jam workshop? You get to take the actual fruits of your labor home. Each workshop costs $45 ($35 for Green Briar members) and you take home four to six (6 oz.) jars of jam. All materials for the workshops are provided. Workshops are on Wednesdays and Saturdays (times vary by season). Pick a jam and review their schedule here.